The Artful Maven: The Scarlet Red Letter?!? Happy Saturday everyone! I hope you were able to sleep in! I didn't have that luxury today, but no biggie because I have thoroughly enjoyed my time getting creatively inky, or should I say stained? My fingers have been stained red for 3 days now. Every time I scrub them clean, I see that I need to touch something up in this scarlet little letter I have created for some challenges. The wonderful people at Simon Says Stamp and Show are having an open interpretation challenge of "a red letter day". The entries so far have wonderful views of a red letter day, which by the way is defined as any day of special significance. Well...when I initially read the theme for this challenge I immediately revisited an old memory of having to read Hawthorne's The Scarlet Letter in high school. A book I loved, and that has probed my differing judgements over and over, as the years have molded me. 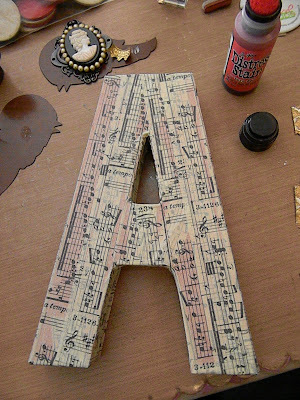 It just so happened as well, that I had a paper mache letter "a". Coincidence? Nope! Anita...Adulterer...both begin with "A", but are NOT synonymous people!!! It's just poetic! So I had to go with it, and create my "red letter day", or shouldn't I say "scarlet"? I am also submitting this to Blogger's Challenge for "wings and things", Gingersnap Creations for the spicy supply challenge of "ribbon", and two new sites to me, the Artistic Stamper challenge for "vintage", and The Stamp Man Challenge "use red", both of which happen to be across the pond...so cool!!! 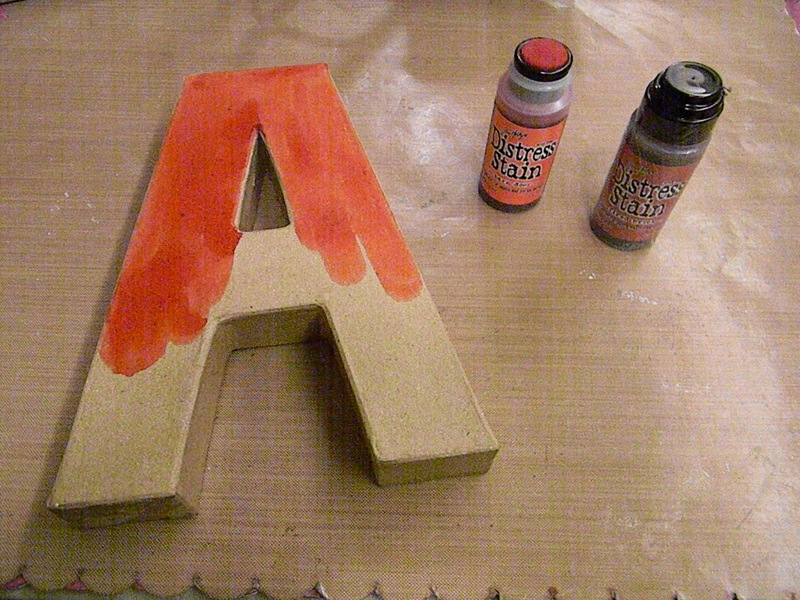 The letter was given a coat of Barn Door Distress Stain. I had to use a paint brush to get in the tight spaces. The letter was covered with Tissue Tape. 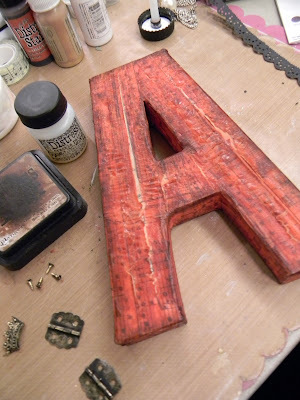 The letter was then stained with Barn Door and Fired Brick. A very heavy coat of Clear Rock Candy Crackle Paint coated the front and back of the letter. After it dried, I used Gathered Twigs to ink the edges and some of the cracks. Finally, a layer of Gesso was added to the entire letter to seal everything in and prevent flaking. I loved the way this came out. The top pair of wings are what the bottom pair originally looked like. I paint them with Snow Cap Acrylic Dabber then with Gold, sort of going in stripes so there would be contrast. After it dried, I gave it a heavy layer of Clear Rock Candy Crackle Paint. When that dried, I coated it with Distress Embossing Ink and UTEE, and used a heat gun to emboss it. I added hinges with brads, that I distressed with Jet Black Acrylic Dabber. Finials, ribbon, paper lace, pearl scrolls, paper roses, pearls, metal leafs, and the cameo were added, along with attached wings. 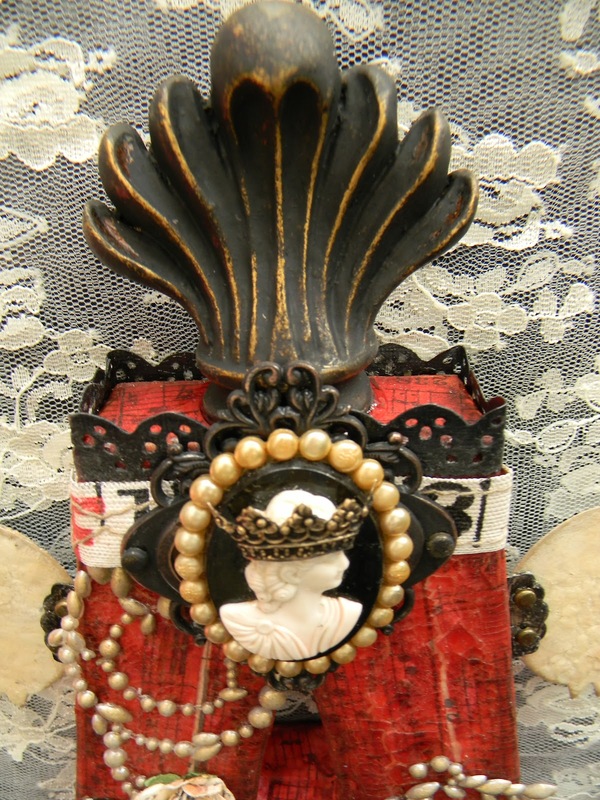 I adhered the cameo into an ornate frame to create this, as well as added the crown to the cameo. For The Blogger's Challenge, this is a blog hop. Let's keep it going! Click on the next entry to move on! Thanks for viewing mine! Wow, Anita, you knocked my socks off with this one! 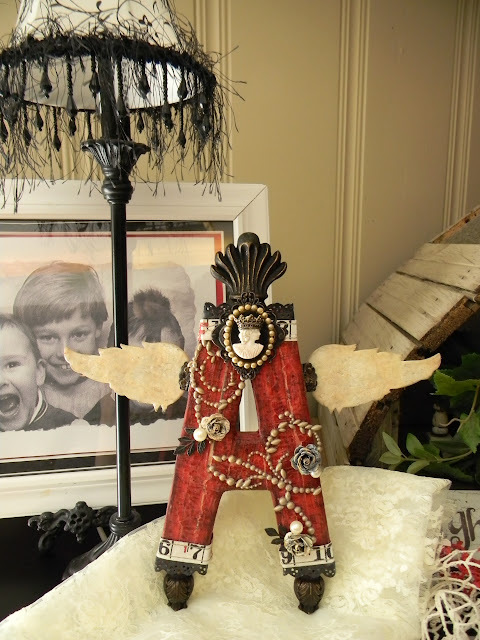 Fabulous job - love the concept and your execution is perfect - lots of wonderful embellishments. Absolutely perfect fit for the Simon Says Stamp and Show Red Letter Day challenge. So happy to have you playing along with us this week. This is amazing! What a wonderful piece of art you've created. Thanks for joining the challenge at Simon Says Stamp & Show. Oh my gosh! This is absolutely stunning! 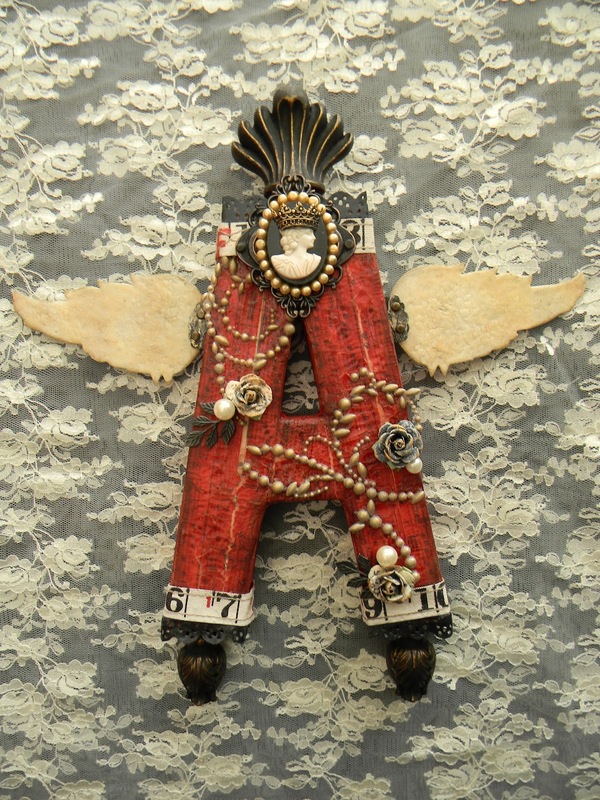 Love your interpretation of the red letter day! Very cool! Love all the embellishments on it. How about A is for AMAZING?! Wow! So many different things to look at. Simply beautimous! I'd like to offer a W as in WOWZA! This is awesome, Anita. 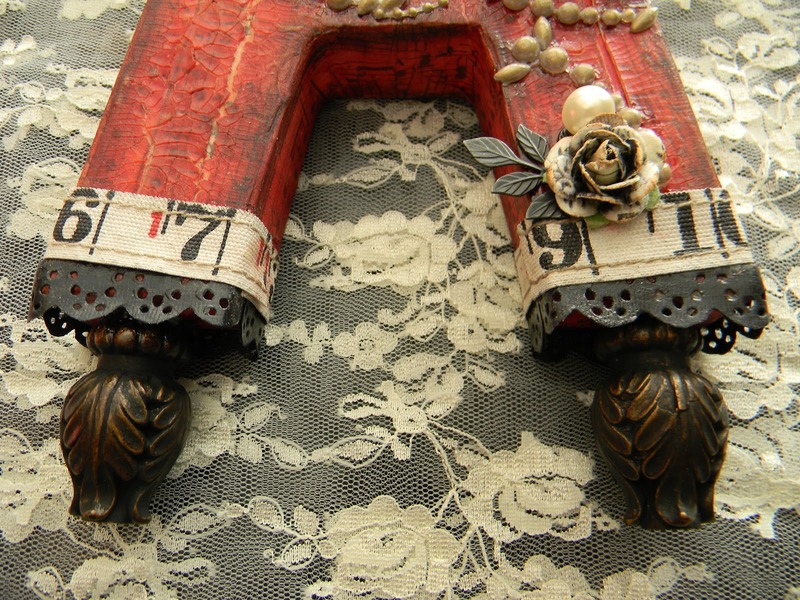 The deep red is fantastic, and I love the ruler ribbon around the edges. I remember being quite moved by that book in high school too. This is a real work of art! Another A-mazing creation Anita. I love the look of the A and the red is stunning. 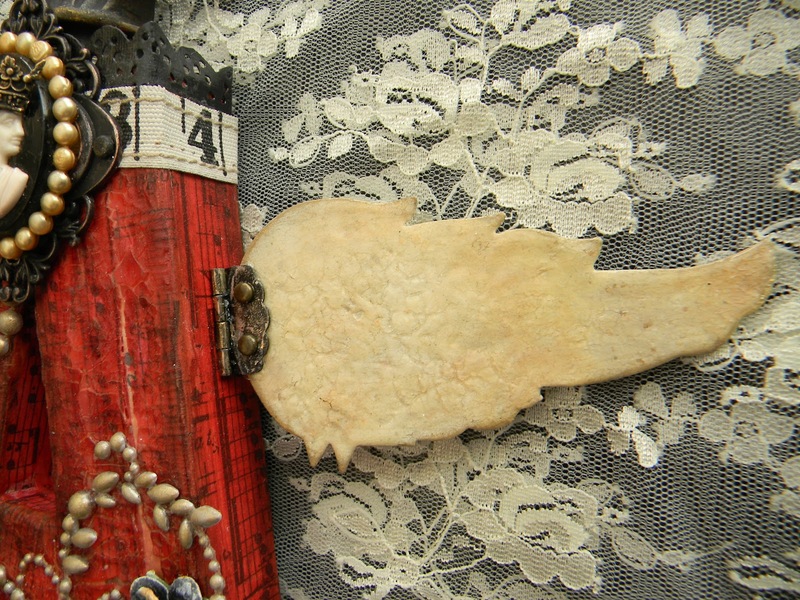 What a great way to attach the wings with the tiny hinges. Way to go girl!! I hope you win some of those v=blog challenges. Your letter is awesome and i was reading a bit on your blog.....omg...your art is stunning. I'm sure coming back later and reading more. Thanks for your nice and appreciated comment on my blog. WOW! This is extreme Red Letter Day ...I LOVE it! Thanks for joining the team at Simon Says Stamp and Show ... we hope to see you again soon! Anita, this is just a stunning piece of art! I love what you did with it. i bought a K a few weeks ago and it is sitting on my ledge naked, staring at me, begging me to do something with it. 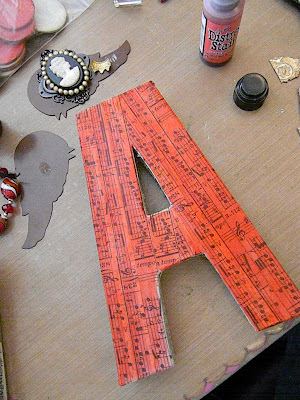 Love your scarlet letter! Especially the hinges on the wing and the feet - they are just awesome! 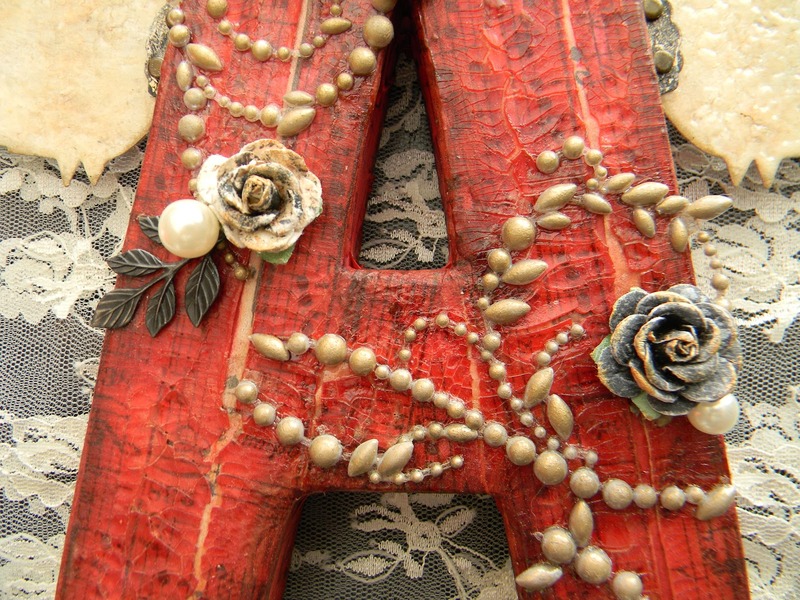 Love your altered letter! Fab embellies and details! Thanks for playing along with the Bloggers Challenge! This is fabulous! I love everything about it! Love the rich color, texture and details on your Scarlett Red Letter. It's beautiful! Absolutely Amazing! Love the wings and the feet. Wow what a Stunning piece, I love everything about it! Thank you for joining us at the Stamp Man 'Red' challenge. Thanks for sharing your great entry with us this month at The Artistic Stamper.....good luck!